The seventh hole green at Teeth of the Dog at the Casa de Campo resort in the Dominican Republic. Casa de Campo is a destination for golfers, for families, for vacationers who desire luxury, for vacationers who want comfort. In short: it's for everyone. Located in the Dominican Republic, Casa de Campo opened in 1974, and the sprawling 7,000-acre resort is one of the world's best. The golf is superb and well-rounded with the crown jewel being Pete Dye's Teeth of the Dog. Its beauty is reminiscent of California's Pebble Beach thanks to its stunning vistas and dramatic pacing. The holes that hug the coastline are worth the trip by themselves. (It's ranked 39th in GOLF's Top 100 Courses in the World for a reason.) Even without the golf offerings, Casa de Campo is a first-class resort. With a range of accommodations and all-inclusive options, it earned the No. 1 ranking in the Value category in GOLF's Premier Resorts ranking. Looking for a sunny destination that can host anything from a buddies trip to a family getaway? This guide will provide a one-stop shop for planning a Casa de Campo vacation. 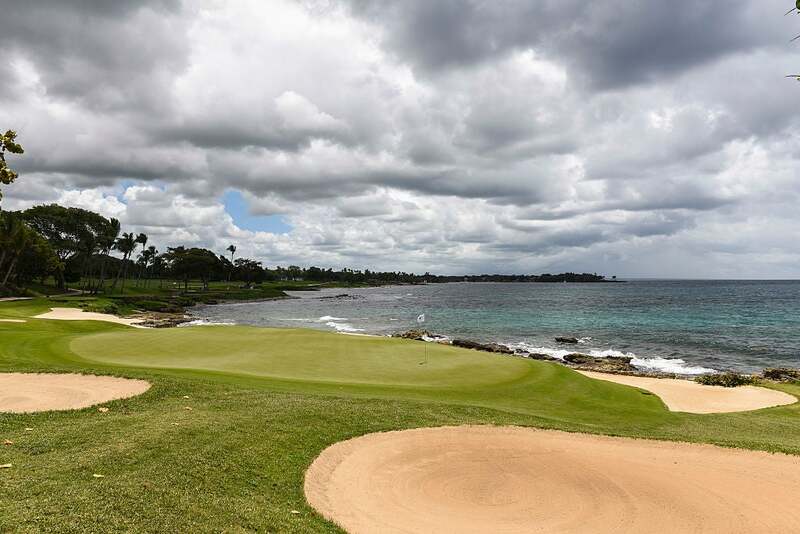 We enlisted GOLF's Joe Passov to describe the golf at Casa de Campo. Travelin’ Joe’s Take: Ask almost any respected architect to name their favorite course that they’ve ever designed and they tend to brush aside the question quickly. “That’s like asking to pick your favorite son or daughter,” is the typical response. Not so with Pete Dye. Without hesitating, Dye singles out Casa de Campo’s Teeth of the Dog. It’s easy to see why Dye is so pleased with what he accomplished. In fact there are seven good reasons—the seven holes that practically melt into the Caribbean Sea. The other 11 holes twist through groves of coconut palms and cashew trees and feature Dye’s early, memorable flat sand bunkers cut into irregular, somewhat linear shapes. While none of the holes are terribly dramatic, each is soaked with strategy. Still, it’s the seaside collection you came for, and it doesn’t disappoint. Your first glimpse of the magical sea is at the par-5 third, on the right side. Sensory overload takes over at the 176-yard, par-3 fifth, the start of an unforgettable four-hole sequence. You practically tee off in the sea. Water laps at the coral rocks as you settle into your stance. You pause, just long enough to take in the sound of the waves, the gentle, warm Dominican breezes and the color contrasts of clear blue seawater, tawny bunkers, vibrant green paspalum grass, flecked coral rock—it just soothes the senses. Eventually you emerge from your daydream and find your way to the 229-yard, par-3 seventh. The hole consists of little more than a tee and a green, the distance between the two being entirely taken up by a long expanse of sand built up from the rocky shore. The hole parallels the Caribbean in its graceful arc and is framed by a large waste bunker, smaller traditional bunkers, mounds and trees. It’s an exquisitely framed, gorgeous golf hole. The back nine delivers more of the same, culminating in a stunning trio of 15, 16 and 17, with the sea to the right. When you walk off the 18th green, you don’t feel like you were in a street fight. In short, Teeth of the Dog is perfect resort golf. Inevitably, Casa de Campo’s other 63 holes are overshadowed by Dye’s 46-year-old masterpiece. They’re definitely worth a look. Unquestionably, the 27-hole Dye Fore, a 10-minute shuttle ride from the resort, is the most underrated course in the Caribbean. Concocted by Dye in 2003, Dye Fore soars with several holes on the Marina nine that dogleg around a boat-filled harbor, then peaks on the Chavon nine, which sports a fistful of holes draped atop 300-foot cliffs that peer down at the Chavon River. Both par-3s, the third and the sixth are unforgettable. More forgettable, however, is the club’s seemingly detached third nine, called Lagos (Lakes), but if you’re in a hurry, this lightly-played layout is the place to tee it up. Dye crafted Casa de Campo’s flattish Links course in 1974, and it serves a worthy purpose, even if it’s not a Top 100-caliber track. It’s the most playable course for higher handicaps, convenient for resort guests and offers plenty of golf in a breeze on the watery back nine. Finally, I can’t really call La Romana Country Club underrated. It’s more unknown. Designed by Dye in 1990, it’s the private club for residents of the Casa de Campo development. Yet, it’s not even offered up to resort guests. Those in the know, however, can make an inquiry—the club keeps a few tee times available for resort guests. Should you play it? Do if it you’re a checklist-type. It’s always cool to have ticked the “secret course” box. It’s a quality layout, too, neither as bold, nor as brutal as Dye Fore, but infused with more character than the Links course. You’ll move around faster, too. As for me, however, I’ll be taking a break for a cold Presidente Pilsner and then headed right back for another bite of the Teeth of the Dog. There are two main accommodation options: resort rooms and villas. Resort rooms offer a private patio/balcony and all the luxury amenities you'd expect. Golfers should target the Golf Lodge rooms, which are located close to the main clubhouse. These rooms have modern touches while maintaining comfortable details like wooden closet doors and ceilings. The villas are gamechangers for large groups. Families or wedding parties can book houses for their stay and live in luxury. Depending on the villa option and your budget, you can have breakfast prepared daily in house, private pools or personal butler and concierge services included. Some of these properties are resorts within a resort. Obviously, it comes with a premium price, with Garden villas beginning at $1,000/night and Oceanfront villas at $4,950. The rub with some all-inclusives is the lack of dining options. Not the case here. Casa de Campo has seven restaurants and six bars on the property, serving a wide variety of cuisines. The Beach Club sits right on the beach and offers a walk-up spot for lunch or an upscale dinner. For a breakfast buffet you've only dreamt of, head to Lago in the mornings. With a table overlooking the 18th hole at Teeth of the Dog and the ocean, there are worse ways to start your day. La Piazzetta is at the scenic Altos de Chavon and has authentic and homey Italian atmosphere, La Casita sits on the marina docks and will satisfy your local Dominican fare desires, and Pubbelly Sushi creates casual Asian food to perfection. While all of the above are included in the standard all-inclusive package, the options are plentiful if you decide to forego the dining plan. There are several other options for dinner that are located within the resort that aren't official resort properties. The concierge service can assist with booking reservations for each night. Note: some require collared shirts and long pants for dinner. Getting to Casa de Campo isn't difficult. Delta, United and JetBlue each have direct flights into Santa Domingo Airport (SDQ) from New York City, and you can get into that airport from various east coast outlets like Atlanta, Orlando or Miami. Flight time from Atlanta is three hours and 40 minutes, and it's in the Atlantic time zone, so it's one hour later than eastern time. From there, it's a little over an hour down a major highway to the resort. Santa Domingo tends to have cheaper routes, but Punta Cana International (PUJ) also has some options from the U.S. and is a bit closer. (If you want to tack on some extra golf, the Jack Nicklaus-designed course at Punta Espada is breathtaking and on the way.) For those who value ease over everything, Casa de Campo also has its own airport, La Romana International Airport (LRM), that's minutes away from the front desk, but is may be tougher to find a flight that fits into your schedule. Casa de Campo offers airport transfer services from all three airports, which is recommended. Once you're at the resort, your rental car won't be cranked up. Even if your clubs stay at home, there's no shortage of options for leisure or activity at Casa de Campo. The beach is the main draw. On the map, it may seem like a small beach for a large resort, but it never feels cramped. With drink service without leaving your chair, a full restaurant and water activity equipment for rent, it leaves you wanting nothing. For a more secluded experience, you can book a trip to Catalina Island, where a boat transports you to an island that is less populated and offers a beautiful reef that is ripe for snorkeling. Next to the main lodge is a pool with cabanas and a swim-up bar. The resort also has a 245-acre shooting center that boasts a 110-foot tower that projects sporting clays, an equestrian center that offers trail rides as well as polo lessons and 13 tennis courts at the tennis center. Altos de Chavon is a replica of a 16th-century Mediterranean town within the resort that has local craft shops and beautiful vistas of the river complete with old-school cobblestone streets. As soon as possible? The region is blessed with perfect weather year-round. The peak season is November-April, when temperatures begin to drop in the northeast. Hotel guests will pay $295 for a round on Teeth of the Dog in those months compared to $190 from May-October. Room/villa rates will face similar proportions, with deals to be found in the summer months. The simplest way is enjoy all the resort has to offer is with a package that includes room, golf and all-inclusive food and drink. A current winter package is listed at $936/day for a couple through Mar. 31. That includes your room, 1 round of golf daily, food/drink, unlimited horseback riding and some water activities. Adding in tax and service fees, the total for three nights would be $3,732. - Altos de Chavon is host to a gorgeous 5,000-seat replica of a Grecian-style amphitheater, and it's worth making the walk down to the stage level to take in the structure from below. If a concert is being hosted during your stay, make plans to attend. - Larimar is a semi-precious blue stone found only in the Dominican Republic. Everett Designs has high-end jewelry featuring larimar, and you can find it in many of the smaller crafts shops around Altos de Chavon. - Cabinet Tobacco Boutique is the place to get your local cigars to enjoy on the course or at night on your patio. - Take an afternoon off the golf course and spend it at the spa. The luxury venue has every treatment imaginable, but the Golfer's Massage for $125 is one that's designed specifically for the movements of the golf swing. It's a perfect antidote for jet lag after a long journey.